1	What’s On. . . . . . . . . . . . . Published by and all advertising sales Cairngorms Business Partnership Tel: 01479 810200. info@visitcairngorms.com www.visitcairngorms.com Produced by Landmark Press Carrbridge www.landmark-press.com Tel: 01479 841900. 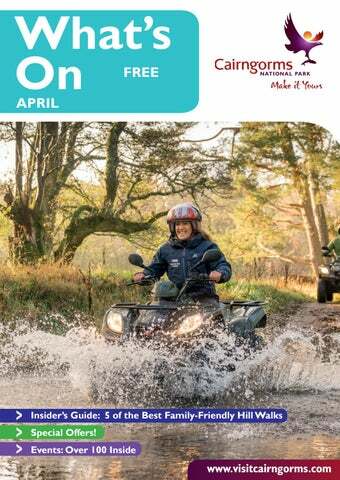 Photo credits: Front Cover: Quad Biking at Rothiemurchus by David Lintern. Photography: Manny Gorman, Richard Webb, Alan O’Dowd, Mark Tate, Nick Bramhall. elcome to the Cairngorms National Park and the April edition of What’s On, the free events guide. This month sees some of the Park’s best loved attractions throw open their doors, like Blair Castle, which is celebrating its 750th year! Landmark Forest Adventure Park (Carrbridge) and the Highland Folk Museum (Newtonmore), too, are back to full operation after winter and both are laying on lots of Easter fun activities for all the family from the 6th until the 22nd. Mar Lodge Estate, on the east side of the Park, is also getting in on the Easter action with its Cadbury Easter Egg Hunt and open day on the 21st. The wildlife in the Park is waking up from winter too. If you want to know more about spotting rare species from pine martens to ospreys, which are starting to make an appearance, then head along to The Grant Arms in Grantown. This is hosting its Wildlife Book Festival, from 15th-19th, which is run in association with BBC Wildlife Magazine. As well as talks, the festival includes guided tours from celebrity wildlife experts. If you fancy a faster pace, then why not enter the Glenlivet 10k or Run Balmoral running races on 7th April and 27th & 28th April respectively? Whatever you do, whether it’s living fast or slow, the Cairngorms National Park has something for everyone! Enduro Series Round 1 Laggan Wolftrax Centre, Strathmashie, Laggan. 9am-8pm. Copy deadline 3rd April for May 2019 edition. Saturday 30th March Ballater Ceilidh Day Victoria & Albert Halls, Ballater. 10am-11pm. www.Facebook.com/ DeeDonCeilidhCollective Strathspey Thistle v Forres Mechanics Highland League Football Match Seafield Park, Grantown on Spey. 3pm. www.facebook.com/strathspeythistlefc F Live Music with Gilly l The Winking Owl, Aviemore. 9pm. T: 01479 812368. Tuesday 2nd April Cairngorm Cycling Club 10-mile Time Trial Woodland Car Park, Aviemore. Glenmore. 6.30-8.30pm. www.cairngormcc.co.uk/events Kosmos in Concert St Bride’s Parish Church, Newtonmore. 7.30-9.30pm. T: 01540 673422.
by Dr Pat Morris Grant Arms Hotel, Grantown on Spey. 4-5pm. T: 01479 872526. www.bwwc.co.uk F Talk: TGABF. How to l be an Urban Birder by David Lindo Grant Arms Hotel, Grantown on Spey. 8-9pm. Every Day in April Every Monday Ballroom Dancing with Kenny Nairn The Duke of Gordon Hotel, Kingussie. 8.30-10.45pm. www.dukeofgordonhotel.co.uk F Live Music l Cairngorm Hotel, Aviemore. 9.30pm. T: 01479 810233. Every Tuesday Community Lunch Boat of Garten Village Hall. 12.30-1.30pm. T: 01479 831123. F Live Music with George l Gordon The Duke of Gordon Hotel, Kingussie. 8.30-10.45pm. www.dukeofgordonhotel.co.uk Quiz Night Cairngorm Hotel, Aviemore. 9.30pm. T: 01479 810233. Community Cafe YMCA Community Centre, Grantown on Spey. 10am-2pm. T: 01479 872262. www.grantowncommunitycentre.org Live Music with Carl Wilson Singer & Guitarist Duke of Gordon Hotel, Kingussie. 8.30-10.30pm. T: 01540 661302. F Live Music with Davy l Holt Cairngorm Hotel, Aviemore. 9.30pm. T: 01479 810233. Shinty www.shinty.com Saturday April 6th Kingussie 1sts v Lochaber The Dell, Kingussie. 2.30pm. Sunday 7th April Strathspey v Glenurquhart Women’s Match Grantown Grammar. Time TBC. 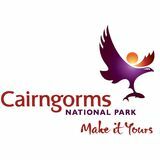 See www.visitcairngorms.com for more information on each of the villages in the area. a whole host Thereâ&#x20AC;&#x2122;s of things to do in the Cairngorms National Park and more and more people are discovering just how special this place is. from the comfort of a luxury Land Rover Discovery. Hand thrown terracotta pottery by Penny Weir. Safaris available April to July and late-October to December. Welcome to the Cairngorms National Park and the April edition of What's On, the free monthly events guide.